Christian Hauglie-Hanssen is the Norwegian Space Centre’s new director general. How does he envision Norway’s future in space? Christian Hauglie-Hanssen previously held the position as director for the Space & Surveillance Division at Kongsberg Defence & Aerospace and has extensive experience from business leadership and commercial development of defense programs, products for civilian use, and aerospace. He has a degree in civil engineering from the Norwegian University of Science and Technology and a Master of Science degree in physics from the University of South Florida. He is also former president of NIFRO, the Norwegian Industry Forum for Space Activities. - After a warm welcome from my colleagues on the first day of the new job, I will now familiarize myself with the issues and matters the Norwegian Space Centre focuses most on, Hauglie-Hanssen says. He is aware of many of these challenges from his previous positions in the Norwegian space industry. Now the regulatory processes in the European space organization ESA will be of particular interest to him. - These include the framework for Norway’s participation in ESA and the preparations for ESA’s council meeting at the ministerial level in 2019, which will set the agenda for the European activities in space the following four years, Hauglie-Hanssen says. The new director also views the technology and growing business opportunities surrounding small satellites as especially important and interesting. This market is gaining increased attention from satellite users both in Norway and abroad. - We’re seeing a definite trend in the industry where the needs of individual nations and utility-based space activities are in rapid development. This is caused by the changes in the technology and the business of space that are collectively called New Space. These will result in smaller and cheaper satellites to enable even small countries like Norway to develop and launch satellites perfectly tailed to their needs, Hauglie-Hanssen says. Norway has already four small satellites in orbit: AISSat-1 and AISSat-2 and NorSat-1 and NorSat-2, and more are on the way. In a growing global market, Andøya Space Center has the potential for becoming the European launch site for small satellites. A study is underway to analyze what Andøya needs to become the launch site in Europe for such satellites. Today, sounding rockets for research, technology demonstrations, and education are launched from Andøya Space Center. - There are several good reasons for Norway to develop and position Andøya as launch site for small satellites, because here local economy and businesses may meet global market needs for mutual benefit, the new space director says. In 2016 the Norwegian Parliament asked the Norwegian Government to formulate a new space strategy. This is currently in development by the Norwegian space industry and other actors in the field, and will be ready in early 2019. The Norwegian Space Centre’s new director general wishes to contribute positively to this process. - The space industry is working hard to increase its visibility, which we now see the politicians have picked up on, among other things because the space industry combines profitability with usefulness, which are sound social economics, Hauglie-Hanssen says. For every NOK invested, the Norwegian space industry generates more than four NOK in return. The European satellite programs Copernicus and Galileo have clear benefits to society and Norway has been part of these programs for years. The Norwegian space industry has several ongoing contracts in these programs. Thus, the new space director is confident Norway’s participation will continue as before. ESA’s scientific projects and robotic exploration of space are part of the agency’s mandatory programs for its member states, which includes Norway. 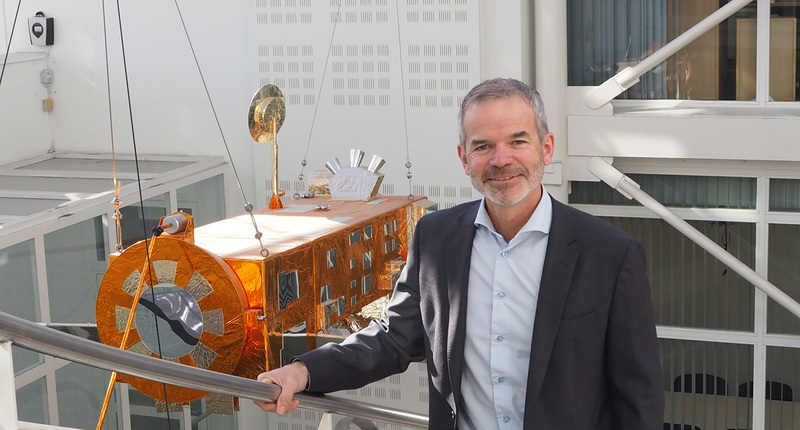 - To secure and develop the opportunities for both Norwegian industry and research in ESA’s various programs is very important and I’m looking forward to learning more about them, Hauglie-Hanssen says. He finds it very positive that the Norwegian space industry has contributed to the Jupiter probe Juice, the planet hunter Plato, the rover ExoMars, and other major ESA projects. When it comes to manned space exploration and the successor to the international space station, the new director wishes to see what opportunities arise. Manned launches to the moon or Mars are still relatively far away in time, but the new space director intends to keep a close eye on the developments. - I’m very excited and pleased with my new position as director for the Norwegian Space Centre and looking forward to working further in a field that I’m deeply enthusiastic about, Hauglie-Hanssen says. He takes the helm as director general for the Norwegian Space Centre after Bo N. Andersen.